Sources in MCL said its internal annual aspirational target of 162.50 mt might have already been revised. With only a month left in the current financial year, although Coal India may inch closer towards its target of producing 610 million tonne (mt) of coal as set by the government, it is likely to miss its aspirational annual output target of 652 primarily due to production issues in key mines of its core subsidiary, Mahanadi Coalfields (MCL). Although the state-owned miner had a MoU target at 610 mt for this fiscal year, the company has internally set a target to achieve 652 mt of production if conditions are favourable. Even if Coal India produces 2 mt of coal daily despite MCL suffering huge production losses, the state-owned miner's total production may be in the range of 580-590 mt by FY19. According to a Coal India official, the company had been producing over 2 mt of coal daily during the month of February except for two days when the production was hampered by unseasonal inclement weather. In turn, it led the company to achieve 58.06 mt of output - the highest ever production achieved for the month of February so far. From September onwards, Coal India had been able to scale up its daily production from 1.5 mt to 2 mt, but it had been hovering around 1.8 mt at times. Till January 2019, the world’s largest coal miner was able to produce 469.65 mt of coal — 6.6 per cent growth year-on-year. Sector analysts predicted 7 per cent production growth for the company, which would help Coal India breach the 600-mt mark in the ongoing financial year, but problems at MCL remain a big challenge in achieving even this number. 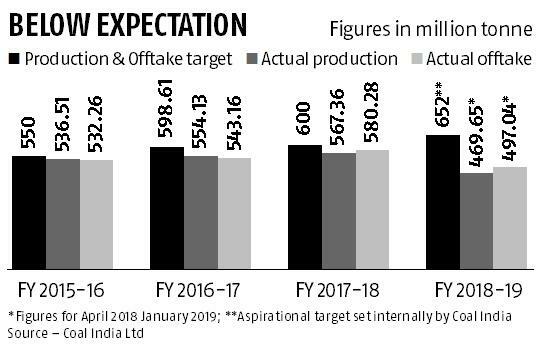 “It is expected that Coal India’s production will increase at a rate of 7 per cent, which would ideally help it reach 606 mt, but it will be far below the target the company had set for itself. However, problems in its core mining areas may result in lower production than expected," Rupesh Sankhe, research analyst at Reliance Securities said. Villagers have been agitating over employment, among other demands, affecting production at key mines like Kaniha in Talcher coalfields and the Hingula open cast mine. Sources in MCL said its internal annual aspirational target of 162.50 mt might have already been revised. 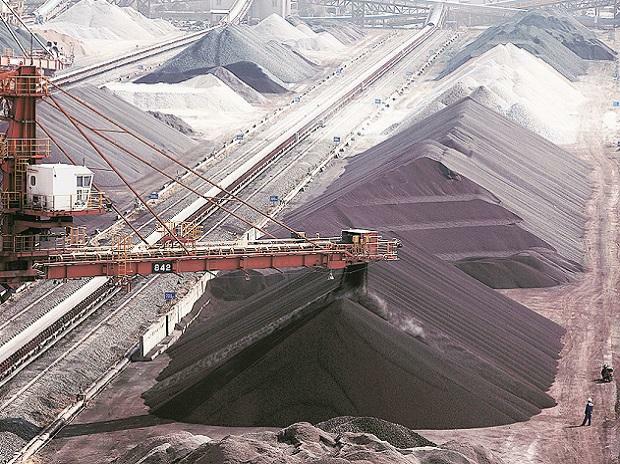 Some officials are sceptical of reaching even last year’s production figure of 143 mt. MCL's output stood at 111.61 mt till January 2019, following a 2.1 per cent decline in production from April 2018. “MCL and SECL (South-Eastern Coalfields Ltd) are larger subsidiaries and hold key mines. Disruptions in these subsidiaries are likely to have an impact on the total production of Coal India," a Coal India executive said. However, SECL scaled up its production by 7.3 per cent at 124.33 mt, although it suffered some setback in January. Sources said during April 2018 till February 2019, the Maharatna company produced 527.71 mt of coal which is a 99 per cent of the targeted achievement till February 2019. According to a company official, during March 2018, Coal India had produced 72.3 mt of coal and this year, even if the company is able to post a zero per cent growth in March on a year-on-year basis, it would still be breaching 600 mt of coal production. The official said that the world’s largest coal miner is focusing on producing more than what it did in March 2018 and if that happens, the company would land as close to the MoU target as possible. Although Coal India has a vast network of 369 mines -- but down from over 450 a year-ago, only 26 are major mines and also commercially and technically viable. These select few mines account for over 60 per cent of the company’s total production. “In India, the biggest problem is lack of contiguous coal seams. In many places, coal occurrences are in patches, which may not be commercially viable to mine at this stage," a Coal India official said.